At 200 CFMs (Cubic Feet of air per Minute) this dryer takes about 30 seconds to dry hands - faster than most. 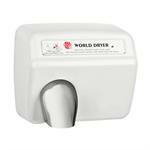 For the same dryer in a high-speed version we recommend the World Dryer AirMax hand dryer. If noise is an issue, stick with the Model A. If you don't see the model you are looking for, please call or email us and we can get it for you. These thermoset polymer cover options have been discontinued and we have only a few of these left - on special. 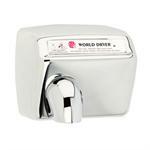 Please see the hand dryer deals page at the bottom of the categories menu to the left to order. 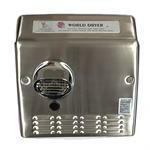 Stainless steel – either brushed or polished. 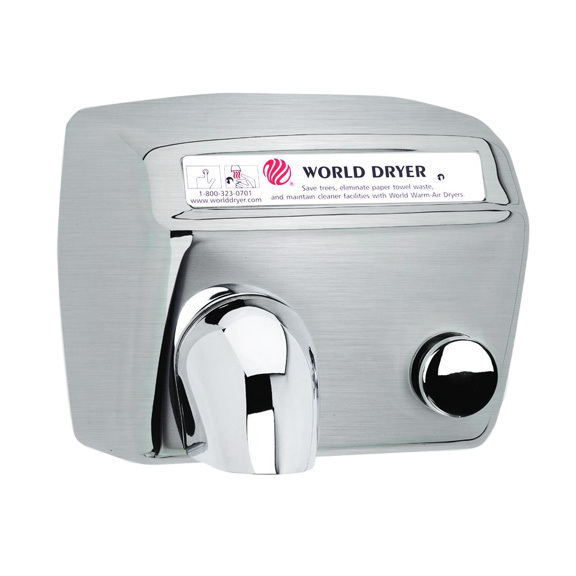 This is also very vandal resistant (particularly the brushed version, which hides small scratches) Stainless is also beautiful, elegant and the easiest material to keep clean. Stamped Steel – white. Steel is very durable and a great alternative to cast iron as it is lighter and less expensive. 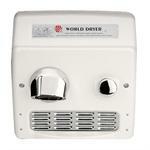 WorldStone – thermoset polymer - DISCONTINUED with limited availabilty. This polymer was developed for the automotive and aerospace industry where lightweight was required in high temperature settings. It is very durable and light scratches can be buffed out. In the long run, this material could look better than steel. It will never rust! 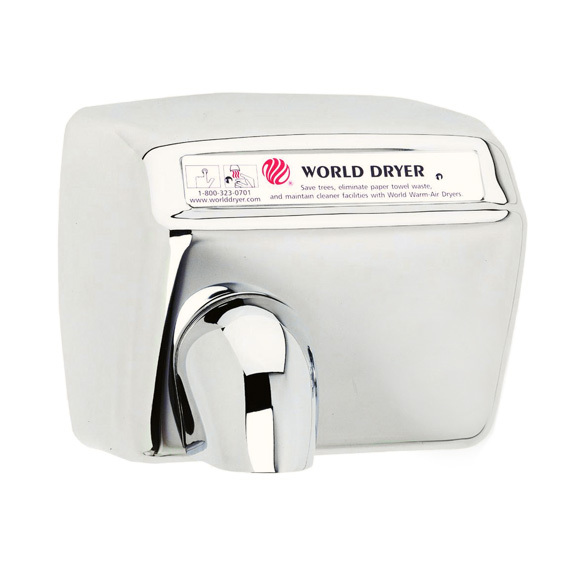 available in white, surface mount, automatic only. Electrical: 2300 watts with a choice of 115, 208/230 or 277 volts. 8.5 – 20 amps depending on your choice of volts. 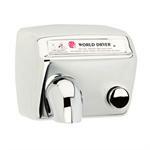 Nozzle settings: The Universal Nozzles on the dryers are all shipped in the fixed setting. 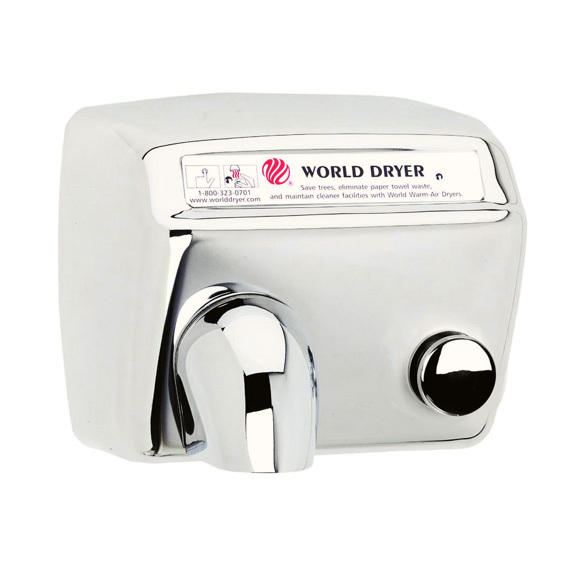 If you want the nozzles to be in the swivel position so that they can rotate up for face and hair drying, use the wrench included to loosen the fixing screw during installation. The "5" in the model number indicates a fixed nozzle. You no longer see model numbers without the "5" since they all now ship fixed. So the A-974 is now the A5-974. 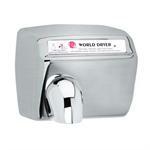 These meet all hand dryer specifications that call for a swivel or flip nozzle. 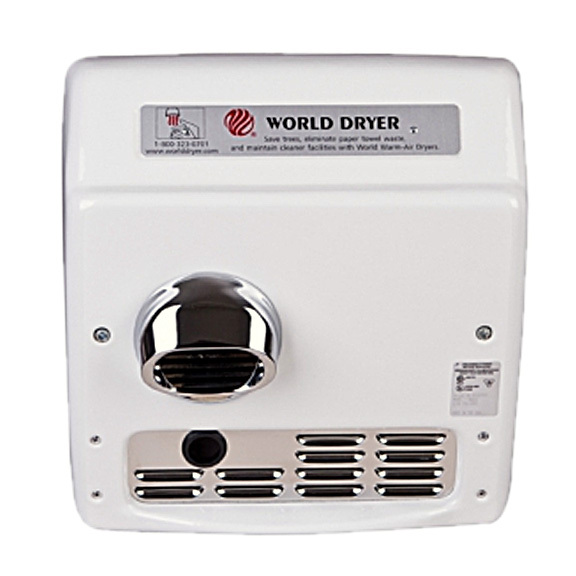 Recessed settings: For an ADA compliant Model A that is 4" off the wall, select a recessed mounted dryer. These dryers all come with the new "Q" nozzle, which is more effective than the old "E" nozzle. Model numbers are therefore RA5-Q975, XRA5-Q974, etc. These model numbers replace the old model numbers of RA5E-974, XRA5E-974, etc. 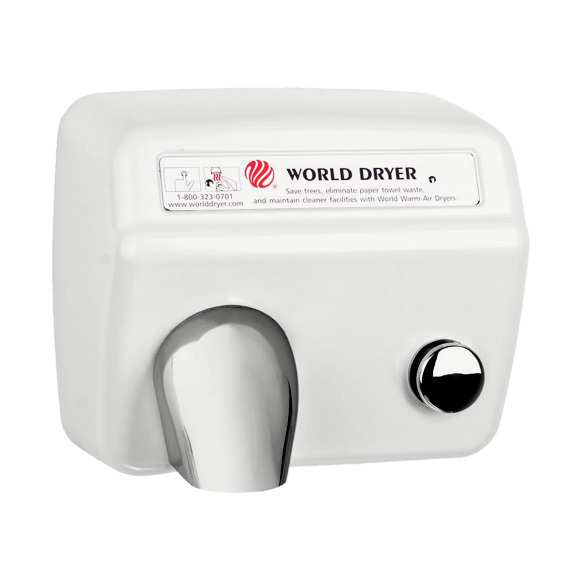 If you still wish to purchase a dryer with an "E" nozzle, we can provide this for you at the same price as the "Q" nozzle dryer. Please email us at info@restroomdirect.com. 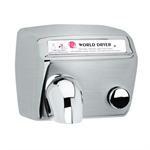 Recessed dryers come together with the wall box that must be installed first into the wall. Cover options are cast iron and the new stainless steel (automatic only). 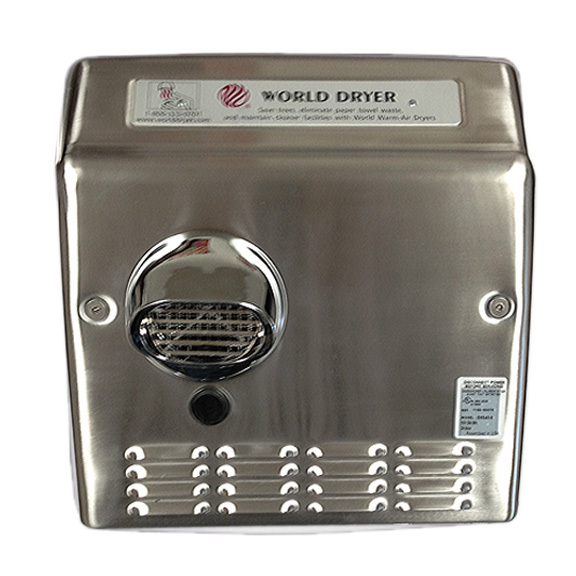 Stainless model numbers (120 volt shown) are DXRA5-Q973 for brushed stainless and DXRA5-Q972 for polished. 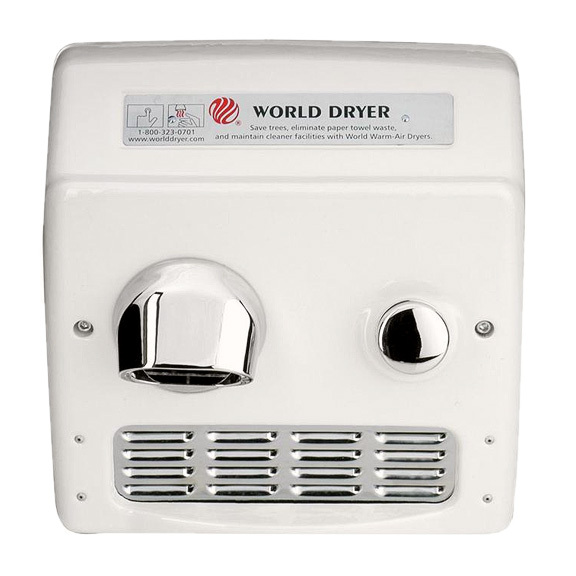 (For other voltages: DXRA54, DXRA57) There are no recessed white steel dryers and World Dryer has discontinued the recessing kit that used to recess the white steel dryers. Limited Warranty: 10 years, 5 years on the sensor, 3 years on the replaceable motor brushes.